Gray and black 25mm slogan badge. This has the slogan Is it NAP time yet written in a fun script font. 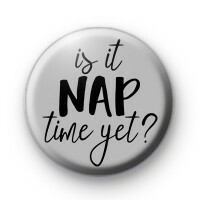 Would be a funny badge to give to a friend/family member who is always tired or if you know someone that likes to have a cheeky afternoon nap. There is no such thing as too much sleep.